If you find a sick or injured wild animal in Virginia, please call the Wildlife Center at 540-942-9453 for advice on the best way to help. After 5:00 p.m., Center veterinarians are on-call to help deal with wildlife emergencies. Wildlife rescuers may call the Center’s number to receive the on-call phone number, then leave a message for our on-call staff. A wildlife emergency includes animals that are having trouble breathing, are non-responsive, lying on their side, bleeding profusely, have broken limbs, or have extensive wounds. Non-injured young wildlife are not considered a medical emergency; please leave a message on the Center’s main phone line and someone will return your call the next day after 9:00 am Eastern. Animals that have been in a cat’s mouth do need treatment even if they aren’t obviously injured; please call the Center for advice. Remember, if you find a baby animal in need, please make sure you aren’t unintentionally removing it from its parent(s)! Please note that in Virginia, wildlife rehabilitators are not permitted to treat adult deer or coyotes. 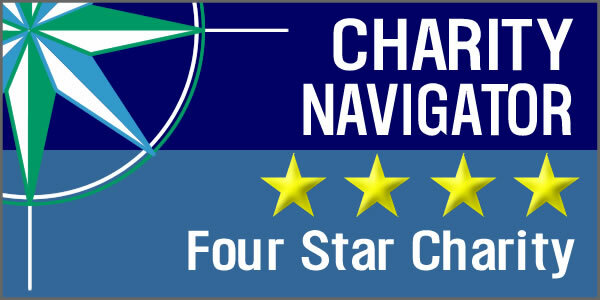 If you find an injured adult deer or coyote, call your local sheriff’s department, animal control, or VDGIF officer. 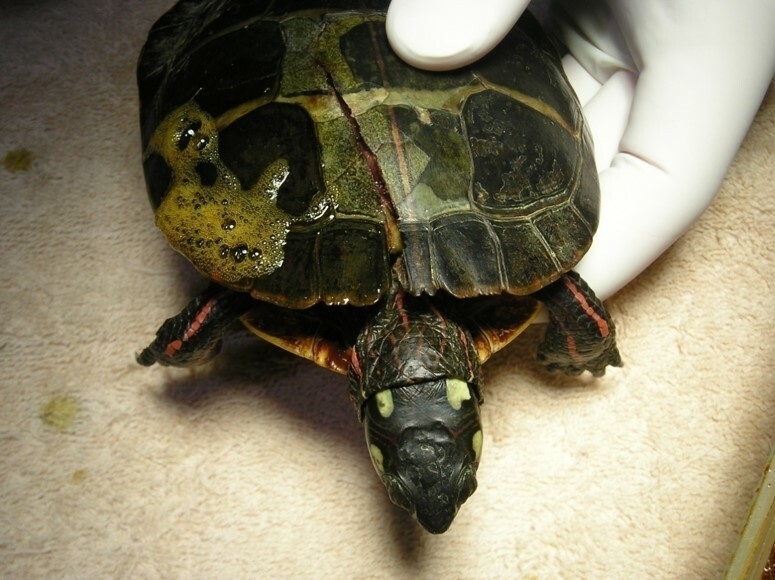 Wildlife rehabilitators are also not permitted to treat and release non-native species, including European Starlings, House Sparrows, Rock Doves [pigeons], Mute Swans, and Red-eared Sliders. Use caution when attempting to capture injured wildlife. Even very debilitated wild animals will attempt to defend themselves. Proper safety equipment (gloves, protective eyewear) should always be used. Other helpful items include blankets/towels, nets, or anything else that allows you to assist the animal without coming into direct contact. Please call the Wildlife Center for specific rescue advice for the species with which you are dealing. If you are unable to reach someone by phone and need to assist an animal quickly, follow these general steps, and always remember to keep yourself safe! Prepare a crate or a box for the injured animal. Line the bottom with a sheet or non-looping towel so that the animal can stand without sliding around. In most cases, throwing a towel or sheet over the animal works well; this helps contain/restrain the animal, and also covers its eyes, which helps reduce stress. Wearing protective gloves, pick up the animal and move into the transport container. Use extra caution when assisting mammals [see below for info on rabies]. Secure the container so that the animal cannot escape. If using a cardboard box, make sure flaps are secured with duct tape. House the animal in a warm, dark, quiet area, away from people and pets. Resist the urge to peek or take photos; while this may be an exciting experience for you, remember it is quite stressful to the wild animal. Avoid talking, loud music, and other disturbing noises. Unless otherwise instructed by a permitted wildlife rehabilitator or veterinarian, do not feed or give water to the animal. Food can often end up making an injured animal sick; it can also impede further treatment when a wildlife rehabilitator receives the animal! Get the animal to a permitted wildlife rehabilitator or veterinarian as soon as possible. Remember, it’s illegal to rehabilitate wildlife without a permit, and illegal to keep wild animals as pets. The goal of wildlife rehabilitation is to treat sick, injured, and orphaned animals and return them to the wild. Trained wildlife professionals will know how to best assist the injured animal in question, and can begin effective treatment with the goal of release. Interested in helping more wild animals? Click here to learn how to put together your own wildlife rescue kit, and/or sign up to be a Wildlife Center volunteer transporter! 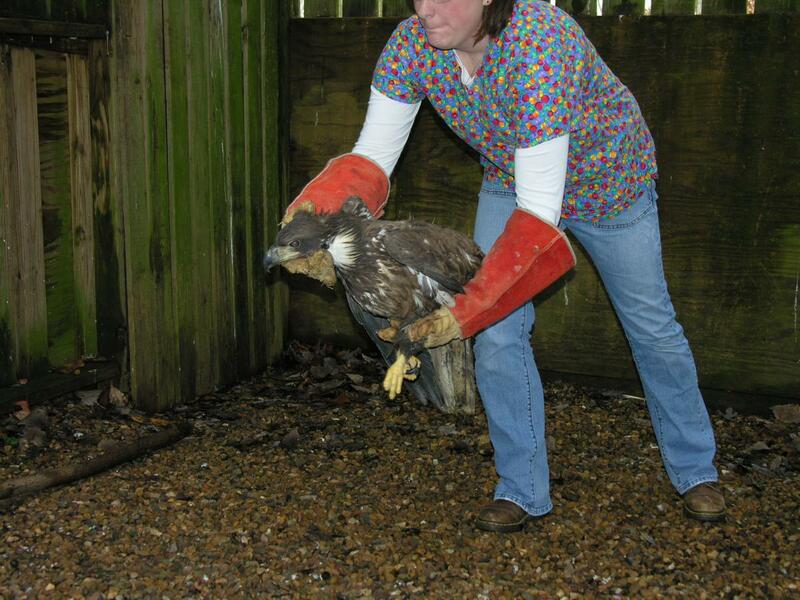 The Center also offers a rescue and transport class through the Wildlife Care Academy. Rabies is a deadly disease in mammals caused by a virus; the most common method of transmission is through a bite wound. Any mammal (including humans) can contract rabies. In nearly all cases, rabies is fatal – prevention is the key. 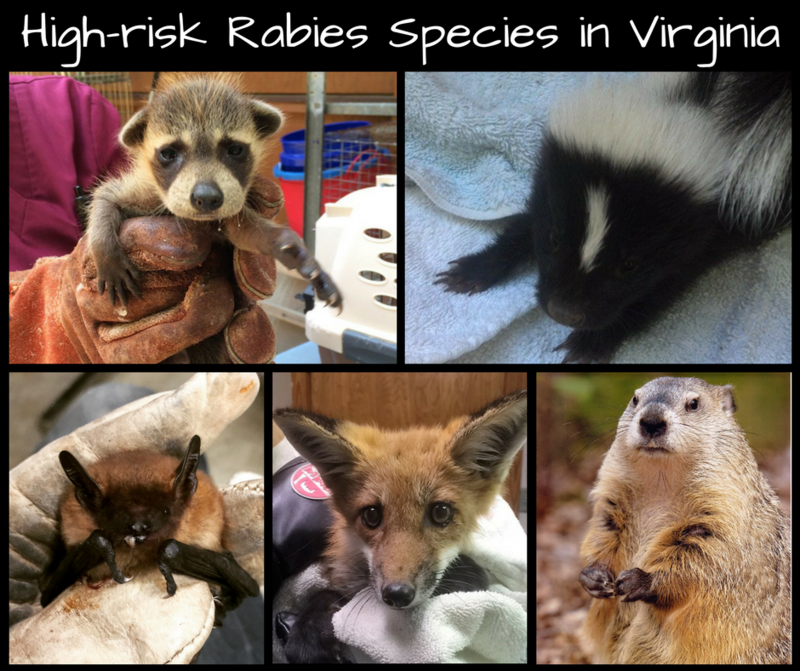 In Virginia, there are five high-risk rabies species: raccoons, skunks, foxes, bats, and woodchucks (groundhogs). Extreme caution should be taken when assisting these animals. According to the Virginia Department of Health, beavers, opossums, and coyotes are also species of special concern. There is no single set of indications that an animal may have rabies; since it is a neurological disease, rabies can manifest itself many ways. While the stereotypical “furious form” (aggressive behavior, foaming at the mouth) is one manifestation of rabies, infected animals more commonly display the paralytic form of rabies, which is exhibited through lethargy, loss of balance, loss of fear of humans or other animals, and general depression. However, those same depressed signs can also indicate distemper (more common than rabies) or head trauma from an injury. It’s also important to note that a mammal may have rabies and not yet be exhibiting any symptoms. Simply seeing a nocturnal, high-risk rabies species out during the day is not an indication of rabies; these animals may be actively looking for food during the day, particularly during baby season. If you have been exposed to a potentially rabid mammal, seek medical treatment immediately. If your pet has been exposed to a potentially rabid mammal, call your veterinarian for further advice. Don’t touch or try to capture the animal. Call animal control for assistance. Wear latex gloves inside small protective leather gloves. Place a small box (with very small air holes) over the bat, then gently slip a sturdy piece of cardboard underneath the box until the bat steps up— be mindful of the bat’s delicate toes. Roll the bat into the container and tape shut. Tape all the seams of the box, as bats are very good at working their way out of crevices. You may also place a hand towel in front of the bat and use a stick to gently encourage the bat to crawl onto the towel. Lift the towel into a box without touching the bat and place in a box with small holes poked in it. Tape all the seams of the box. Wear latex medical gloves inside of leather gloves to handle the infant as you place it in a box or crate. Never handle the animal without wearing gloves; even very young mammals can carry rabies.